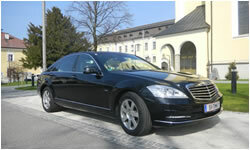 At TMW Salzburg Limousines & Taxis, we provide top-quality service. Our high standards equate to a well-respected reputation in the industry. Once customers enjoy our services, they return again and again. Airport Shuttle We offer high quality airport transfers for discerning travellers and business people. Our driver awaits you with a nameplate at the airport and brings you wherever you want. Holiday Shuttle Whether you come alone or with a group, whether you land in Salzburg, Vienna or in Munich, our transfer service is well known for individual transfers, high reliability and reasonable prices.